What are issue maps and what are they for? The aim of this post is to share some reflections following our session exploring the most recent batch of maps with potential users in Oxford last Friday. Three of us who were there agreed to write posts: Michele Mauri from Milano who is leading the work on the design of the maps; Kat Jungnickel, a freelancer with a background in ethnography/STS who has been doing participant observation with an issue professional for The Young Foundation, and me. Mine will focus on the interesting and difficult questions that lie at the heart of the EMAPS project: What could the maps be (and for who), what are they for, and how do we work together to create them in an iterative process? My questions and attempts at answers are situated in the project’s work over recent months on the topic of ageing, and my own practice/research in social design and service design. The Young Foundation’s role in the EMAPS project is about public engagement – helping identify and engage participants in the project who are probably not researchers (in the academy) but what Richard Rogers calls ‘issue professionals’, for whom research is probably part of their work. At our EMAPS meeting in mid-June 2012, we (my former colleague Jacques Mizan and I) brought together around 25 such people from the UK working in different ways in relation to the ageing issue, from different kinds of organizational context from consultants, public service managers, to volunteers, to care workers. We found it hard to work out who to invite (and get them in the room) because we were not sure what the proposed issue maps on ageing might be for. We know that the EMAPS project aims to design maps of controversies and explore their purposes in relation to complex collective issues. But in our day-to-day interactions we did not find it easy to summarise the project when talking to our colleagues within The Young Foundation or in discussion with potential participants. We did not understand how such maps might fit within the work practices of people who work within the ageing issue, which are of course diverse and shaped by different kinds of professional expertise and knowledge. The EMAPS-wide project discussion that followed that workshop in June then lead to our next phase of work, which took us in a new direction: away from showing people the latest maps and asking for feedback, or asking what they might do with them, or what other maps they might find useful, towards understanding one issue professional’s work practices, and designing maps for her as a kind of lead user (von Hippel 1986). From Kat’s analysis of Maria’s work practices (documented earlier on this blog), the EMAPS team in Paris and Milano then created maps that aimed to help her answer her ‘research questions’. So on Friday, we created a workshop in two sessions. First we showed Maria the latest maps (lead by Kat and Michele and Benedetta) and got Maria’s responses drawing on her deeper knowledge of the project through her work with Kat. We also asked for her feedback about what we planned to do after lunch, when we broadened the discussion by bringing in three other ageing issue professionals, known to Maria. We (Kat and I) had decided that rather than asking for their feedback, we wanted to elicit responses to the maps by asking them to try to do some tasks with them – which we checked with Maria. MAP 2: What are the public health and social care messages about ageing and dementia? TASK (work together): You are developing a campaign aimed at people to increase awareness around the parents and neighbours having dementia. What are the core messages you want to communicate? Use the map to see. Having presented a task relevant to their world, the participants then looked at the maps as they began to try to think through what the map was presenting them with. Quite quickly we moved away from the task. Later, we did not insist on using the task we had prepared for Map 1 as by then the conversations flowed well and also the sense of asking “What would I do with this map?” By they time we looked at the set of maps of type Map 3 (images from Google searches for ageing), we no longer needed a task to get them to engage, but we did repeatedly ask what they might use these maps for and how and when. This approach draws heavily on a design/research field I will go on to explore a bit later. As well as actively participating in the session (Michele, Benedetta, Kat and I) we also documented the activities with audio, video, photography and taking notes. Here are some of my initial observations – which may appear bleedingly obvious to some of our research partners – but are perhaps worth of noting down here, if only to show much work it takes to involve someone who is not a specialist in digital methods or issue mapping, in understanding what the maps might be (for) and what it takes for them to be of use. They may of course be completely different to the views of Kat, Michele and Benedetta although we of course discussed what we did, what we observed and participated in and what we made of it through the day. We need to do more work to understand how these various purposes come into play in different professional contexts and through various disciplinary practices. From observing the four issue professionals in the room in Oxford we noted quite different responses to the same map, even though they shared some common projects and knowledge about the ageing issue and its actors. For example one participant said that the map of linguistic expressions from the corpus of documents (Map 2 – the milky way map) was not useful, whereas two others strongly believed it was and that it was something they could use for example to help them align their own grant-funding bids or proposals to funders’ or commissioner’s current concerns. While this is partly the result of the visual presentation of the data, it is also about how participants grappled with understanding what the map is, and where the data come from, and what the map offers them as a resource. We suspect that these responses are shaped by many factors including cognitive and learning styles, and disciplinary practices about how research and strategy are done in organizations of different kinds. I now want to turn to a field that I think EMAPS can learn from, and which has certainly shaped how The Young Foundation (through my interventions) has participated in the project. Participatory Design (PD) is a field that combines a Scandinavian political/social commitment to worker empowerment, with a practical understanding of collective design. Much of the research/practice in PD has focused on the design of software. One of the leading contributors to PD is Pelle Ehn (see Ehn 1988). More recently several researchers (who often design software as part of their research) are exploring STS/ANT in relation to this design work (eg Ehn 2008; Binder et al 2011; Andersen et al 2011). - How to understand and design for “use” (eg within existing practices) and how “design” relates to use by re-configuring practices or involving the creation of new practices (eg Ehn 1988; Suchman et al 1998; Redstorm 2008). - How design-work can be thought of as performatively constituting the new relations between actors involved (eg Hartswood et al 2002; Andersen et al 2011). - How to understand participation in design work eg thinking of their active participation as language games (Ehn 1988). At our EMAPS meeting in June, we agreed that The Young Foundation would host an ‘issue safari’ in November 2012 bringing together a wider group of issue professionals working on ageing, to explore the latest iteration of the maps. In my email to the wider EMAPS team a couple of weeks ago, I again proposed that we create some tasks that are meaningful within the worlds of such professionals. We prototyped this approach in Oxford last Friday, and it worked well enough to provoke a conversation that surfaced what would the participants do with these maps, from which we then meandered onwards and outwards. In response Tommaso pointed out that the EMAPS researchers will be on hand to guide participants through the safari, which sounds great – until we have to explain it to someone who is a busy professional. 1. Find someone with an existing task related to ageing, that we could work in relation to and modify/create some maps for. An example from one of our participants from Friday is working on the creation of a new ‘Joint Strategic Needs Assessment’– a framework for gathering, sharing and interpreting data about needs relating to older people in Oxfordshire (in social care and healthcare). However I don’t think this is going to work for two reasons. First, although this project is happening and could suit our project in some ways, the data they need are mostly regional, not national or cross-European, and are probably not available online and therefore not available easily to EMAPS. 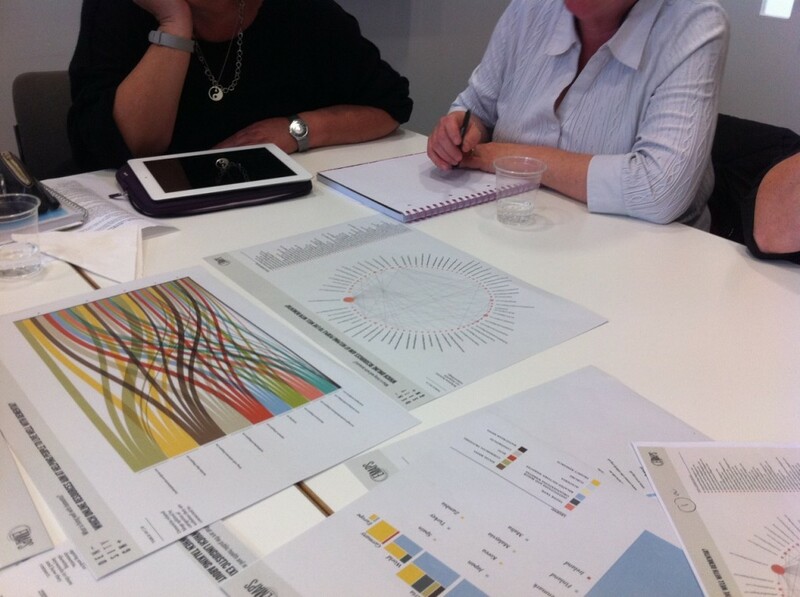 Secondly, the participant did not find the maps we shared on Friday to be that useful although they were ‘interesting’. Although very involved in the collective sharing and use of data in relation to ageing, this participant seemed not to value the purposes I suggest above eg provoking discussion about controversies within ageing between different people looking at or using maps; verifying or challenging an existing understanding of the ageing issue; seeing new sets of relationships (eg between actors or linguistic terms or concepts) in relation to the ageing issue. So we don’t propose following this up. 2. 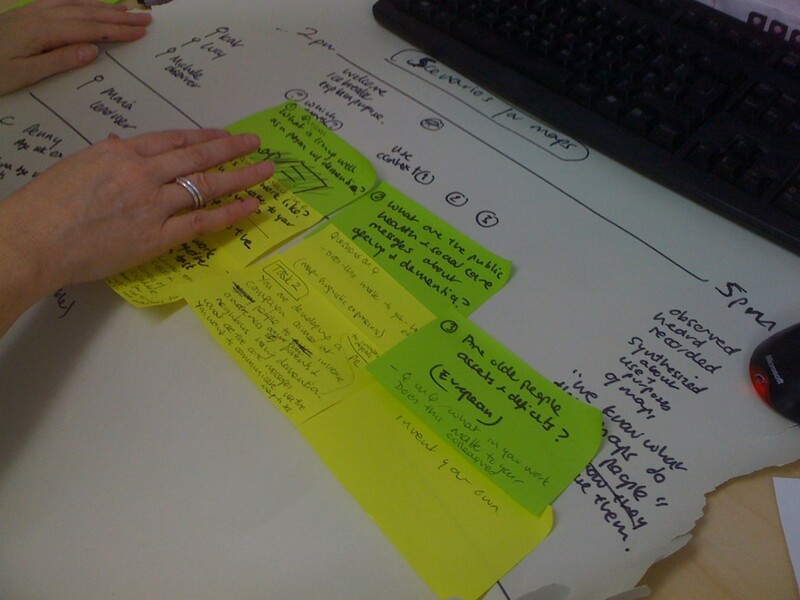 Create some tasks in collaboration with a couple of participants (eg Maria – but she’s about to leave the UK for three months) which are recognizable to them and others and draw directly on their work practices. Eg further developing the tasks we proposed on Friday. I have had discussions with my Young Foundation colleague Sue Nunn who is now going to work on the EMAPS project with us, and she can identify several issue professionals within ageing/social care who she thinks do the kind of work of pattern recognizing/strategic overviewing that we think the maps support. We suspect that this will lead to requests from us to Paris/Amsterdam/Milano to adapt the current set of maps and possibly use new data (eg possibly documents they can supply us with). We’ll get back to you next week with more on this. And finally, a series of questions for EMAPS going forward. Please accept my apologies if I have misunderstood some aspects of the project and these questions are already taken care of in different ways. Below I used the terminology from the Participatory Design field (“use” and “design”) – which may not be right (especially as they separate out design and use) but at least offer a way in to helping understand what the maps might be for, so EMAPS can design better maps. - Understanding use before design. 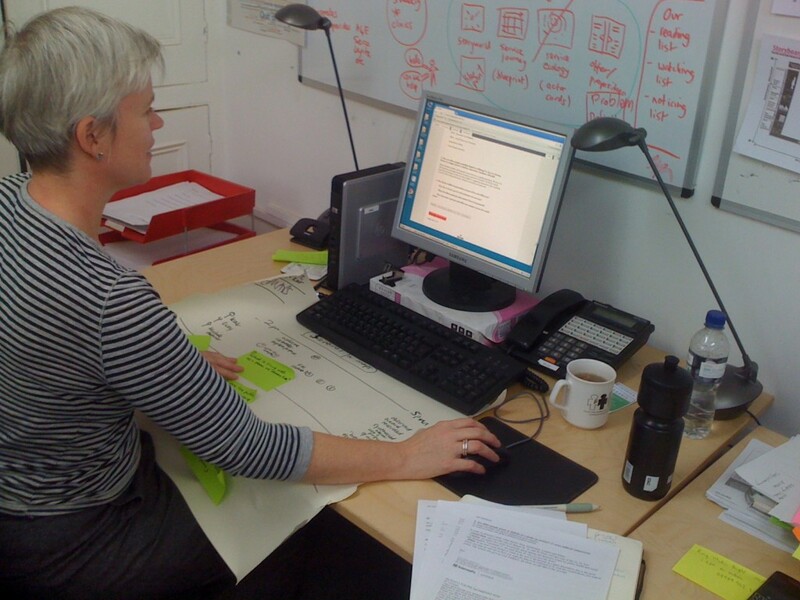 In this ageing project, we were able to recruit Maria and use Kat to work closely with her to develop a shared understanding of her work practices to support EMAP designing maps that are more closely aligned to the questions she has. Are there plans for years 2&3 to learn from this and work closely with users (in the way Kat did) to translate their practices into research questions for maps, before designing and producing them? I know there is a conversation between EMAPS and the weADAPT community which involves sharing maps (or right now, wireframes of future maps) with them and asking for responses. However I am talking about something additional and in more depth – which involves using an ethnographic approach to studying the practices of people within the weADAPT community – not just asking them what they think of maps, after we have designed them. - Understanding use after design. Much of the researcher effort in EMAPS seems to focus on designing the methods, gathering the data, designing the maps and engaging participants, but I wonder if there might be resources to focus on how the maps get used as boundary objects (eg Carlile 2002) in work contexts: This would add a focus on how they are used once we are finished. - Involving participants directly in fast participatory design. There is another possibility, which draws on the PD tradition in another way which would look like this: inviting people from the weADAPT community to take part in a practical workshop with EMAPS, in which we do a very fast cycle of understanding their work practices and research questions, translating this to a set of questions that EMAPS could answer, creating questions and gathering data, and producing maps, and then watching what they do with them – all over two days. Apologies for the busy blog post but I felt it was time to synthesize a number of conversations we’ve been having at The Young Foundation. Andersen, T., Halse, J., Moll, J. (2011): Design Interventions as Multiple Becomings of Healthcare. Nordes ’11: the 4th Nordic Design Research Conference – Making Design Matter. Helsinki, Finland, May 29 -31, 2010. pp. 11-20. Binder, T. Giorgio De Michelis, Pelle Ehn, Giulio Jacucci, Giulio Linde and Ina Wagner. 2011. Design Things. Cambridge: MIT Press. Carlile, P. 2002. “A Pragmatic View of Knowledge and Boundaries: Boundary Objects in New Product Development.” Organization Science, 13(4): 442-455. Ehn, P. 1988. Work-Oriented Design of Computer Artifacts. Hillsdale, NJ: Lawrence Erlbaum Associates. Ehn, P. 2008. “Participation in Design Things.” In Proceedings of the Tenth Anniversary Conference on Participatory Design 2008 (PDC ’08). Indiana University, Indianapolis, IN, USA, 92-101. Hartswood, M., R. Procter, R. Slack, A. Voss, M. Büscher, and M. Rouncefield. 2002. “Co-realisation: towards a principled synthesis of ethnomethodology and participatory design.” Scandinavian Journal of Information Systems, 14(2): 9–30. Hippel, Eric (1986) “Lead Users: A Source of Novel Product Concepts,” Management Science 32, no. 7 (July): 791-805. Redström, J. (2008). RE: Definitions of use. Design Studies, 29(4), 410-423. Suchman, L., Blomberg, J., Orr, J., & Trigg, R. (1998). Reconstructing technologies as social practice. The American Behavioral Scientist, 43(3). Lucy and I have been preparing for the next workshop on the developing maps to be held in Oxford on Friday (12th October). In addition to our lead ‘user’, we have invited four health and social care professionals, who are all experts in their fields (policy, volunteer organisations, advocacy, arts). The aim of the session is threefold: (1) elicit discussion about what maps are useful and for what purposes, (2) observe, listen, record and synthesize information about the use and purpose of maps and (3) ascertain “what these maps do” for these people and how they could use them. - Discuss what this core question/issue means to health and social care professionals. ie.How it matters to their work? How and in what ways it matters to their colleagues? - Show the map/s and set a group task in which participants are asked to use the map to ascertain directions/ outcomes. Further discussion will be encouraged. We will be documenting the workshop in various ways; notes, audio, video and still photos. © 2012 EMAPS | Powered by WordPress | Theme 'Sirup' by 1000ff | 45 queries 0.234 sec.